Just a short drive from Albufeira’s town centre you’ll find Eden Resort — a secluded hill-top resort filled with over 200 accommodation options from one bedroom apartments to four bedroom villas with private pools. The resort itself is massive and packs most of the things you’d need for a holiday. There’s a tennis/football court for the sporty types; a mini-market for your daily essentials; a kids club to keep the little ones entertained; a restaurant and bar (with a second one coming soon); animation teams and 5 outdoor pools. Read on to find out how Geets and I spent our two-night stay in Eden’s gorgeous two-bedroom villas. If I ever felt the need to drop my bags and say the words “holy crap”, this was it; our villa was so spacious and well decorated that it made me want to move in. Best of all, all this space was just ours. 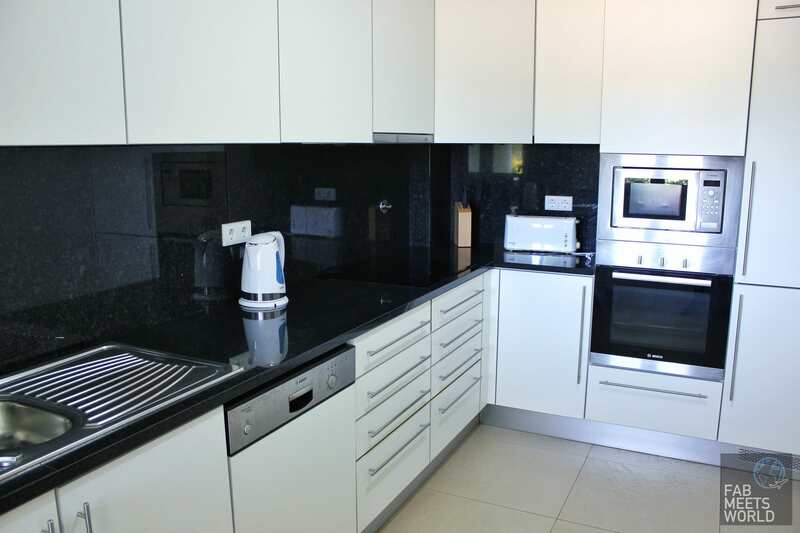 We had our own fully-furnished kitchen so that if we wanted to cook our own meals, we could. While you might think this is pointless on holiday, it’s a great option for families who prefer not to go all-inclusive and cater for themselves. Our two-bedroom villa at Eden Resort also featured an awesome living area with two large sofa-beds (they’re really comfy! ), a smart TV and dining table area too. What stood out to me was just how spacious this place was. You won’t have any problems with a large family here, that’s for sure! As if that wasn’t enough, Eden Resort’s two-bedroom villas also come with a downstairs communal toilet and small living room/spare bedroom to make good, practical use of space. 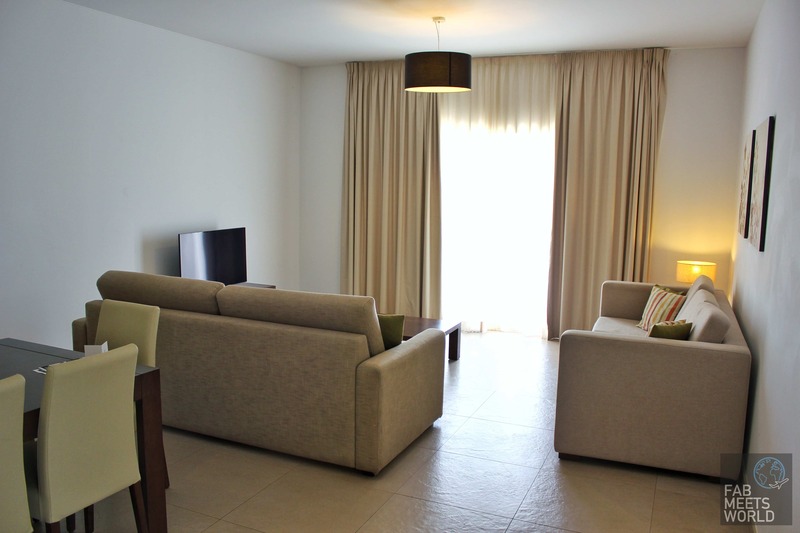 Head upstairs and you’ll find two large bedrooms; one on either side of the corridor. The master bedroom felt only slightly larger than the other and honestly, they’re both decorated and furnished to a high standard so I can’t see any couples arguing over who gets the “better” room. And to add, just in case you do end up in that situation, take into account that both en-suite bathrooms are identical. The only thing actually worth disputing is the balcony with a pool view — the master bedroom comes out on top for that. Whether you opt for all-inclusive or not, it’s convenient that Eden Resort covers breakfast, lunch and dinner. The quality of food in their main restaurant was generally pretty good and although we only stayed for a couple of nights, we enjoyed every meal. My only concern there is the limited number of options for an all-inclusive resort; breakfast covers the standard continental breakfast for example, but lacks anything in the bakery department like pastries, cakes etc. Lunch and dinner times were slightly better in terms of variety, and the quality of food was very good. Eden Resort also has a poolside bar (at the main pool) that serves food like sandwiches, pizzas, burgers and fries for lunch. The food isn’t going to blow your mind, but it is super convenient when you’re dipping in-and-out of the pool and can’t be bothered to drive into town for lunch. Their newly renovated bar, located one floor above the restaurant, is a welcoming and cosy place to have a drink. 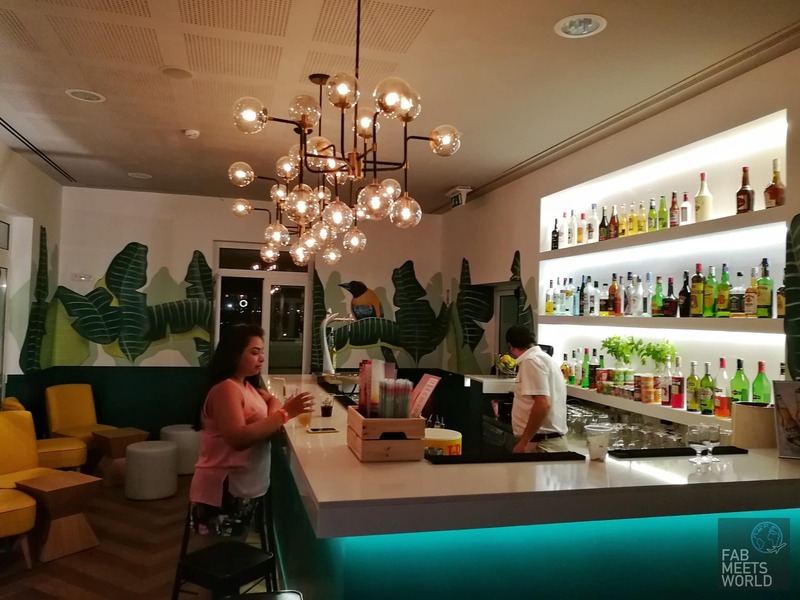 The colourful and tropical vibe works well with the rest of the resort’s theme and after a long day relaxing by the pool, they’ve made the bar a fun and vibrant place to have a drink. So, is it worth going all-inclusive? Sure, if you don’t want the headache of leaving the resort for meal times and will drink alcohol. But whatever you choose, I’d recommend exploring some of the local restaurants to mix it up a little. I don’t think any holiday is truly complete without a relaxing spa experience. Right? That’s why I was so happy when I found out Eden Resort has their own Adam & Eve spa. Along with a range of treatments and therapies you can check out here, the Adam & Eve spa also features an indoor swimming pool, Turkish bath and sauna. Geets and I took on their “Paradise Special” for couples (worth €160) and I’ll tell you what: I came out of that massage room feeling like I was floating. 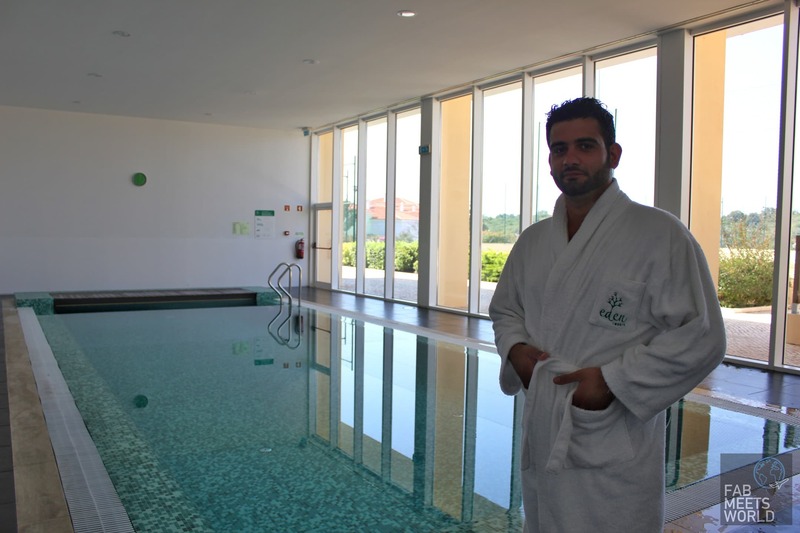 The Adam & Eve spa uses very particular regional ingredients/products sourced from Algarve in their treatments, and their masseuses were fantastic. If I had two suggestions for improvement (not complaints) it would be that their soundproofing could be better as their massage rooms are fairly close to the spa entrance, and the treatment rooms need a little more effort. Compared to other spas I’ve been to, the décor felt quite bare and simplistic. Those two niggles aside, I’d highly recommend the spa experience at Adam & Eve spa at Eden Resort! Whether you’re going on holiday with your family or whether it’s a couple’s retreat, Eden Resort in Algarve is set up to cater for all. There are 5 swimming pools in total and while all of them can handle adults & children, Eden Resort has an adults-only pool too. Luckily our villa was conveniently located right next to the adult pool, so in my case, that meant less noise and commotion. The concern whenever you book a remote villa or hotel is, how do you get into the town centre without a rental car? Fortunately, Eden Resort has guests covered with a shuttle service that regularly makes the trip into Albufeira town centre. Just head outside the reception area and a mini-van will come every so often to pick up and drop off guests. Would I stay at Eden Resort in Albufeira, Algarve again? Most definitely. 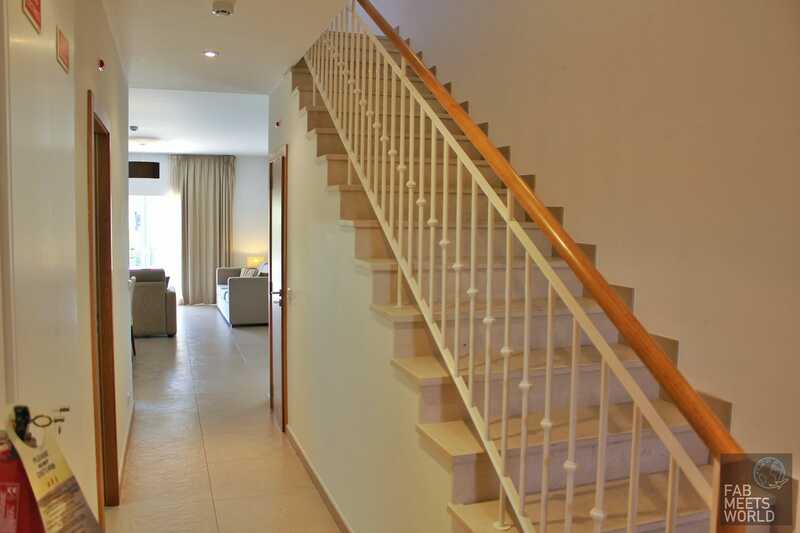 I think they’ve done a good job of catering for most people, the villas are awesome and it’s well set-up to give people a fun, relaxing holiday in Algarve.